Aleksandr Gorokhovsky. Photo taken by Raul Uporov for Uralsk Week. Used with permission. A media fact-checking workshop in northwestern Kazakhstan came to an abrupt conclusion on September 15 when police barged in, broke up the event and arrested one of the workshop leaders, Aleksandr Gorokhovsky. The workshop's organiser, Lukpan Akhmedyarov, is the editor of independent regional newspaper Uralskaya Nedelya, that has long been the target of state harassment. 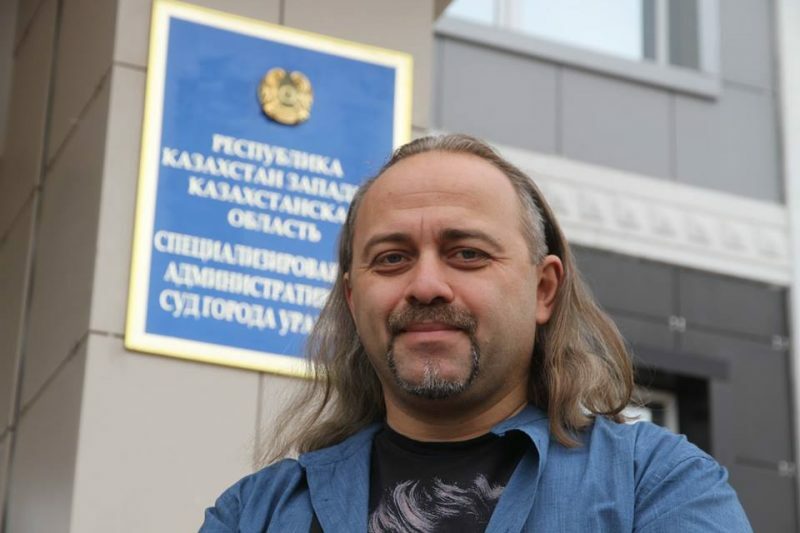 A respected journalist and media trainer from Kyiv, Gorokhovsky was slapped with a fine of roughly USD $110 after a Kazakh court found him guilty of violating Kazakhstan's migration legislation. 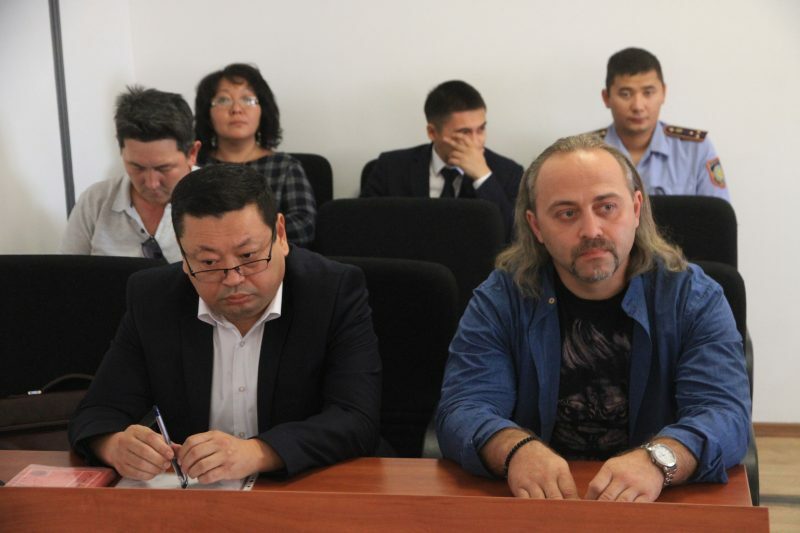 The public prosecutor argued that when entering Kazakhstan, Gorokhovsky had failed to indicate who had invited him to the country on his migration form. Aleksandr Gorokhovsky with his lawyer. Lukpan Akhmedyarov is sitting in the row behind. Photo taken by Raul Uporov for Uralsk Week. Used with permission. Ukraine emerged as something of a leader in media fact-checking after Russia invaded and annexed its territory of Crimea in 2014. The invasion was accompanied by a strident propaganda offensive that served to justify Moscow's actions towards the country. Organisations like StopFake.org emerged as Ukrainian journalists worked to peg back the tide of lies emanating from Russian state media for the benefit of audiences both inside and outside Ukraine. Gorokhovsky's own media project, Bez Brehni (the name of which translates as Without Lies), is another website in the same genre that works with the International Fact Checking Network. He has also authored a book on fact-checking. The arrival of a Ukrainian media trainer would logically cause anxieties for authorities in Uralsk, a town close to Kazakhstan's border with Russia. The country's leadership tends to avoid any discussion of Ukraine, reflecting a keen sensitivity to the pro-Moscow separatist potential in its own northern regions, where Russian influence is strongest. But a more powerful motive for the police invasion may have been the fact the youth journalism school itself was the brainchild of Akhmedyarov, editor of the Uralskaya Nedelya newspaper, whose relentless reporting on corruption has been a thorn in the side for authorities in the region for years. The litany of obstacles described by Akhmedyarov is part and parcel of life for Uralskaya Nedelya, which is one of the few remaining independent media in authoritarian Kazakhstan. These challenges are nothing new for Akhmedyarov and other staff at Uralskaya Nedelya, and some have been nearly fatal. In 2012, Akhmedyarov was attacked by a group of men who stabbed him multiple times and shot with air pistols. Although four men were sentenced to jail terms in connection with the attack, its ultimate organiser was never identified. “It's dangerous to be your friend, Lukpan, you get fined for that,” joked one journalist colleague on Facebook after Gorokhovsky's punishment was confirmed. An open disregard for the rule of law in Uralsk showed through in Gorokhovsky's trial, which descended into a farce almost immediately. At the back of the courtroom, a man Uralskaya Nedelya journalists assumed was a young representative of Kazakhstan's Committee of National Security, a successor to the Soviet-era KGB, shielded his face from photographers.